A European Space Agency dummy named Matroshka in and out of his white traveling poncho (right and left panels, respectively). Matroshka contains natural bone and real blood cells along with synthetic organs, in order to help researchers test the effects of radiation. A real dummy packed with bone and blood cells will endurean intense radiation shower that simulates a solar flare — all in the name ofspace exploration. The plan involves using a high-energy proton beam tostrike a life-sizereplica of a human torso embedded with hundreds of radiation sensors.Future astronauts headed forthe moon or Mars won't have the protection of Earth's magnetic fieldagainst solar radiation storms, and so scientists want to understand how muchthe human body can endure. The "Phantom torso" dummy consists of naturalbone, simulated skin and organs, and real human blood cells. "We put blood cells in small tubes in the stomachand in some places in the bone marrow," said Francis Cucinotta, chiefscientist for NASA's Radiation Program at the Johnson Space Center in Houston. "One of the questions we have is whether the less shielded parts of thebone marrow will be [much harder hit]." The amount of radiation that reaches the bone marrowcould raise risks of leukemia and other cancers. Researchers can also watch thereal blood cells in the dummy so see how much the radiation damages DNA, andwhether the cells end up self-destructing or turning cancerous. Astronauts have typically endured "chronicexposure" to low-level radiation on past and current missions, when thebody has time to repair or replace damaged cells. But acute exposure to intenseradiation over a period of minutes or hours — such as during a solar flareevent — represents a more dangerousdose. "The biological effects are very sensitive to thedose rate," Cucinotta explained. "A dose of radiation delivered overa short amount of time is two to three times more damaging than the same doseover a few days." Apollo astronauts had a near-miss between the Apollo 16and 17 missions to the moon, when an erupting sunspot unleashed arecord-setting barrage of solar radiation in 1972. Researchers plan to recreatethat event's effects at NASA's Space Radiation Lab at Brookhaven NationalLaboratory in Upton, New York, by using a high-energy beam of protons on the EuropeanSpace Agency's Phantom Torso, named Matroshka. Matroshka also has a NASA counterpart named Fred. 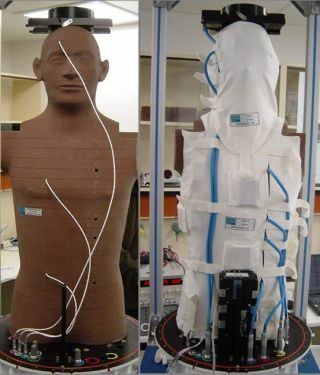 Bothdummies have flown inexperiments aboard the space shuttle and the InternationalSpace Station to show how chronic exposure to background radiation affectsthe human body. Whether chronic or acute exposure, the dummies can takemultiple blasts of space radiation. A quick transfusion of new red blood cells,and then they're off on their next space adventure.